The current Mazda2 happens to be one of the more fun-to-drive subcompacts on the market, but it's nearing the end of its run. Last night Mazda dropped a preview of the concept that is most likely its replacement. 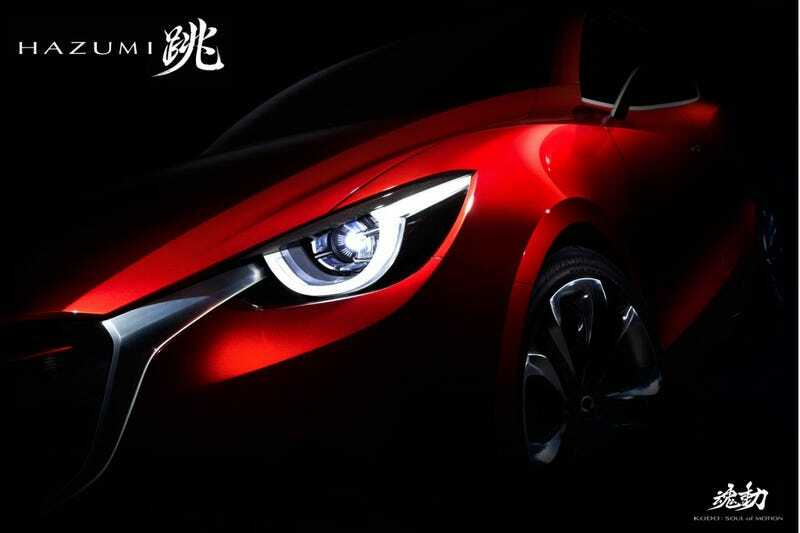 This is the teaser for the Mazda Hazumi Concept, which is set to debut soon at the Geneva Motor Show. They say "Hazumi" means "bound" or "spring up," like something full of energy or an animal about to pounce on its prey. Swell. The important thing is that they say the concept "expresses the ideal form of the company's next-generation subcompact car," so we can assume it will look pretty close — if not identical — to the next Mazda2. Mazda has been turning out some pretty attractive cars as of late, so this is something to look forward to. Also at Geneva, Mazda says they will show off their latest 1.5-liter SkyActiv-D diesel engine. Hey, we're still waiting on just one of them to show up in this country. Now: Let's talk Mazdaspeed2. I'm in if you are, Mazda.